Glenavon goalkeeper Alan Blayney has agreed a move to Ballymena United. 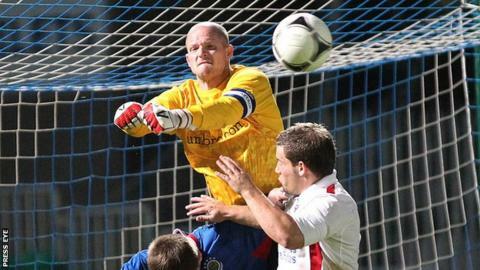 The former Linfield keeper previously played with the Braidmen in the 2008-9 season before moving to the Windsor Park outfit. Belfast-born Blayney, 33, spent five seasons with Southampton before spells at Doncaster, Oldham, Bohemians, Ballymena and Linfield. Blayney, who has three Northern Ireland caps, moved to Glenavon from Linfield at the end of last season. He was named Ulster Footballer of the Year in 2010-11.